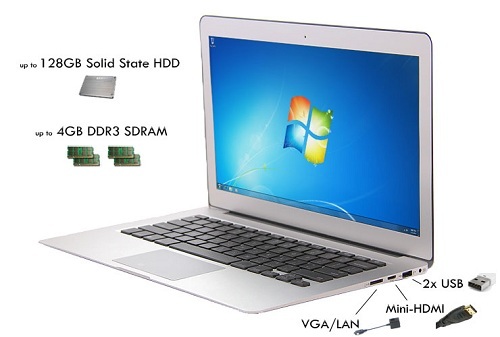 Netbook Navigator are one of those firms who seem to be unable to make up their minds what they want to be, initially we know of them as being a tablet manufacturer, but now it seems that they are into ultrabooks too, but like their tablets the Nav13X is small and neat in design. There are couple of things that may put buyers off with the Nav13X, the first being that there is no operating installed and the second is that in order to access the Ethernet and mini HDMI port the user has to plug in an adapter, it’s not a deal breaker but for some users it may just be annoying. Apart from those couple of issues the Navigator Nav13X is a nice looking ultrabook and has a neat 13.3 inch, WSVGA Back lit LED Display with a 1366 x 768 of pixel resolutions and it has a built in 1.3 mega pixel web camera. 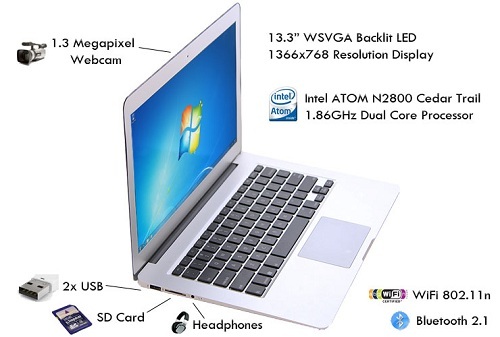 It is going to the powered by the latest Cedar Trail version of the Intel ATOM N2800 1.86 GHz Dual Core processor. With a choice of memory from 2 GB to 4 GB of DDR3 SDRAM available and the buyer can choose from a 32 GB, 64 GB or the 128 GB 1.8 solid state drive (SSD) for their storage requirements. It has the usual networking and connectivity features such as Wi-Fi 802.11n and Bluetooth 2.1, two standard style USB 2.0 ports and an SD Card Slot. However, it uses a special adapter for the Mini-HDMI port and the VGA/LAN RJ-45, which is a little awkward. When it comes to size the Navigator Nav13X measures just 12.9 inches (W) x 8.6 inches (H) x 0.6 inches (D) and weighs in at just 2.9 pounds (1.3 kg) with the 3 Core 4100 mAh Li-Ion battery pack installed. 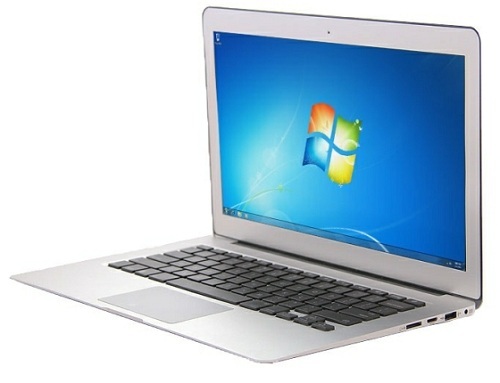 The Netbook Navigator is priced at around $500 with no operating system installed. The buyer can choose the Microsoft Windows 7 Home operating system at the following rates, Home Premium at $100, Professional at $150 or the Ultimate version for an extra $200!